The Dracula's Kiss is a haunting and easy drink for your signature cocktail at your next Halloween bash. It is nothing more than black cherry vodka, grenadine, and cola. This makes it—essentially—a spiked Cherry Coke. Yet, it's a bit more interesting than that simple description. As is ​common with Halloween cocktails, we have to add a little visual flair and in this case, that comes in the form of a "bloody" twist inside the glass. 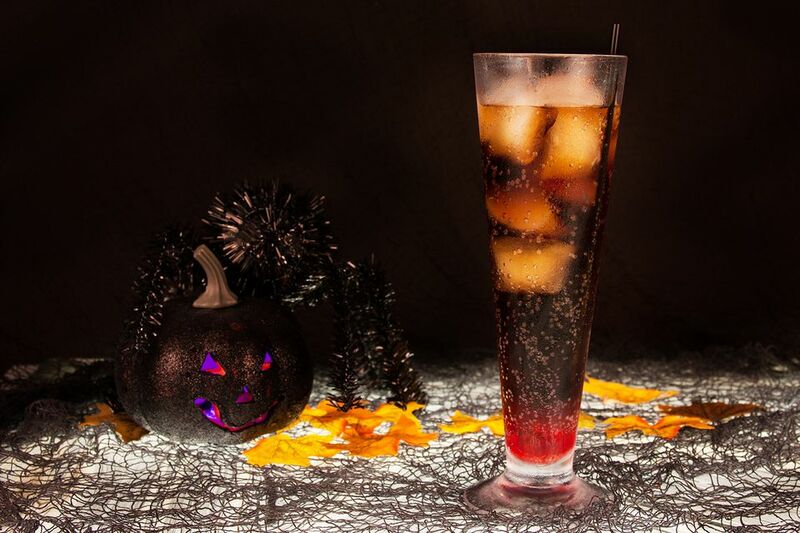 The Dracula's Kiss is built in two layers: the bottom is red with grenadine and the top is black with cola. It's actually quite a cool effect and one that requires no special skills or ​practice of your ability to float drink ingredients. The two layers are naturally formed and are only disturbed when the drink is stirred. For those who want to get a little craftier, consider adding a creepy garnish. You might also notice a similarity here to a non-alcoholic drink called the Roy Rogers. If we were to take the vodka out of the Dracula's Kiss, we would be left with that popular mix of grenadine and cola. How Strong Is the Dracula's Kiss? In order to estimate the strength of the Dracula's Kiss cocktail, we need to make a few assumptions. Let's suppose that we use a 40-proof black cherry vodka and 5-ounces of soda to top it off. With that said, we can say that this drink averages out to 5% ABV (10 proof). That means that you can skip the pumpkin cocktails this Halloween and enjoy a great soda highball without unknowingly turning into a zombie overnight.